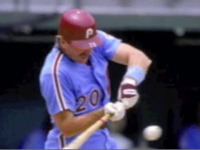 There is little doubt that baseball player Mike Schmidt had some of the most impressive numbers when it comes to belting the ball out of the park, but those who played against him and saw him play may always remember him for the way he stood at the plate. In the end, although the way in which he did stand was odd, it helped him in his hitting and truly threw off the pitchers he faced. Now that spring training is ending, it is always interesting to look back at the all-time greats, those who made names for themselves by not only playing during the regular season, but sharpening their skills during spring training. When you look at most of the hitters in major league baseball, you notice that most of them stand a certain way. They stand with their shoulder facing the pitcher, creating probably the smallest target out of their own body as possible. This reduces the risk of getting hit in a vital spot. Mike Schmidt, however, did not stand that way, instead he turned a bit so that his back was mostly what faced the pitcher. To add a final touch to his batting warm up he was also known for shaking his behind while waiting for the pitch, which earned him many female fans. Schmidt would say that by turning in this way, it became nearly impossible for a pitcher to jam him up by pitching inside. The alternative was to hit him and put him on base anyway, and his baserunning abilities then came into play. Schmidt played his entire career with the Philadelphia Phillies. In 1972 the team traded away third baseman Don Mooney to open a slot for the hot prospect out of Ohio University. Schmidt, in turn, returned the favor by hitting 18 home runs. However, he ended the season only batting .196 and had 136 strikeouts. The very next year things improved for Schmidt and his batting average rose to .282. Those numbers helped earn him his first trip to the All Star game. He also showed just how much power he could have at the plate, particularly during a game on June 10 when he hit a baseball into a public address system suspended 117 above the stadium floor and 329 feet from home plate. The ball then fell to the field and, since it was in the Houston Astrodome, it was still considered in play. It held Schmidt to only a single, but the signal had been sent that this was not someone to trifle with. Schmidt’s biggest year was 1980 when he would make his only trip to the World Series. Over the course of the season he hit 48 home runs to help the Phillies get into the postseason. Those numbers would end up earning him the National League MVP. Most importantly, he would help the Phillies charge through the playoffs and then into the World Series and come away with a World Series championship. By the time Schmidt retired, in 1989, his stats were truly stunning. He was World Series MVP in 1980. He was also a 12-time All Star and eight-time National League home run champion. He was a 10-time Gold Glove winner, he played third base. He was a six-time Silver Slugger winner and a three-time National League MVP. He even hit four home runs in one game, on April 17, 1976, a truly rare accomplishment in the sport. His career batting average was .267. Schmidt hit and overall 548 home runs total to earn him membership in the 500 Home Run Club. He also notched 1,595 Runs Batted In.